This is my first time photographing in a studio-setting, with proper lighting set up, appropriate backdrop, and a subject who wants photos for her modelling portfolio. I was confident in my technical knowledge of photography, but working with a subject/client is a completely different beast! It requires constant communication with the subject about: different poses, where the model should look, what should she/he do with her hands, etc. It is not like landscape photography where you wait for the golden hour and click. There were moments during this photo-shoot, for instance, where I was not necessarily content with the images I am producing, but had difficulty communicating to the subject what I want. Ultimately, I think more experience will boost the photographer's confidence in communication. 2. Experiment with lighting set up. This photo-shoot was organized by Garry Black, who used various lighting equipment and set-ups. He asked the model to stand in one spot and moved the lighting equipment accordingly. Once we have settled on a lighting set-up, the images produced also varied depending on where the photographer stood. I learned that, unless you have a specific image you want to accomplish, it is worth playing around with the set-up, do test shots, show it to the model, and see if it is the direction you both want to go. In this particular instance, the model really liked moodier shots, which makes use of shadows and highlights. 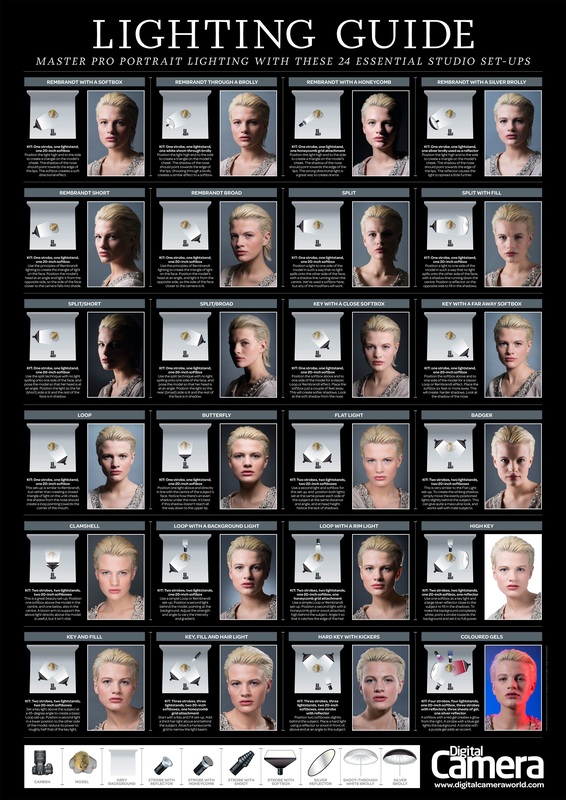 I find this lighting guide helpful in summing up some of the lighting set-up from this photo-shoot. 3. WIDE-ANGLE LENSES CAN CAUSE UNWANTED DISTORTION. While distortion can sometimes be good in various types of photography - landscape, for example - it is often unflattering in portraiture. Perspective distortion happens when the camera is extremely close to the subject's face. This can lead to a subject's facial features to appear bigger than they actually are! Think of someone sticking a camera in your face, for example. Shooting with a wide-angle lens or a lens shorter than a 35mm might be good for full-body or environmental portraiture, but it can be extremely unflattering when doing head-shots. Many portrait photographers recommend using a lens longer than a 50mm. Higher than 75mm are often used with full-frame cameras. For cropped-censor cameras, which many amateur photographers use, a 50mm will achieve the same field of view as a 70mm or so on a full-frame. 4. Its okay to crop the top of the head. I've always found cropping of portraits difficult. Before going in to this photo-shoot, I had the impression that a portraiture should always include the face (obviously) and the whole head! I learned during this photo-shoot that the top of the head can be cropped (see second image above). Sometimes the top of the head - often the hair - can lead the audience's gaze away from the model's beautiful face. In this case, the overheard lighting was causing the subject's hair to be too-highlighted. By cropping the top of the head, I was able to remove the unwanted highlights and lead the viewer's gaze to the subject's face. The image on the right is a good guide of where you should and should not be cropping. For portraiture, you can crop at any of the green lines and below except at the top of the head. You should reconsider cropping where the red lines appear. You can see that cropping the ears, the wrists, and the elbow can lead to awkward composition. Of course, there is no set rule for where you should crop, but it is important to be cognizant when post-editing. 5. Shake up the composition. All the photos I took during this photo-shoot are fairly traditional. Traditional portraiture is often characterized by a head-shot, two-thirds, or full-body framing and where the face is the predominant element of the image produced. All the photos during this photo-shoot were shot in portrait mode. I wish now that I had played around with the composition of the images, maybe shoot in landscape mode and include more of the background, or do an extremely close up shot to showcase the subjects beautiful facial features. These will be for next time.